JOHN DEERE HYDRAULIC PUMP REPAIR KIT. REPAIRS 65CM PUMP WITH SERIAL PLATE. 4000 4020 4320 4230 4430 4630 ALL WITH 65CM PUMP. AR53301 INLET VALVE 8 PCS. R105583 VALVE SEAT INSERTS 8 pcs. RE23382 OUTLET VALVE 8 PCS. R80558 BEARING RACE 1 PC. RE29107 SEAL KIT 1 KIT. 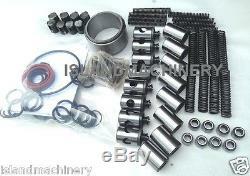 The item "JOHN DEERE HYDRAULIC PUMP REPAIR KIT. 4000 4020 4320 4230 4430 4630 65CM PUMP" is in sale since Friday, November 23, 2018. This item is in the category "Business & Industrial\Heavy Equipment, Parts & Attachments\Heavy Equipment Parts & Accessories\Antique & Vintage Equipment Parts". The seller is "islandmachinery" and is located in Aquebogue, New York.